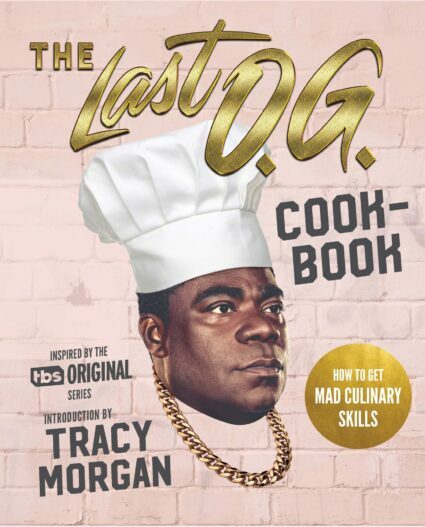 NEW YORK – Houghton Mifflin Harcourt announced today it will publish the cookbook companion to the breakout TBS comedy, The Last O.G., starring Tracy Morgan and Tiffany Haddish. With an introduction by Tracy Morgan, THE LAST O.G. COOKBOOK: How to Get Mad Culinary Skills will feature recipes inspired by the show with elements woven throughout that will immerse readers in the O.G. world. When The Last O.G. premiered in April 2018, it skyrocketed to quickly become the #1 new comedy on cable television (Nielsen). Tracy Morgan plays Tray Barker, a recently released ex-convict who, upon returning to his hometown of Brooklyn to find his girlfriend (Tiffany Haddish) married to another man and his neighborhood gentrified, relies on his cooking skills to find his place in a city he often doesn't recognize. The soulful recipes in THE LAST O.G. COOKBOOK offer outrageously addictive taste sensations, combinations that may seem wacky but work wonders. Readers will learn how to make fantastically flavorful dishes such as Dessert Loaf, Chopped Cheese Dip, and Prison Pad Thai, as well as recipes that evoke the melting pot that is Brooklyn, both old and new, relying on African-American classics reinterpreted for the modern cook. In this vein are Tray’s To Die Dreaming Fried Chicken and Waffles, Shay’s Repast Spaghetti, and Bobby’s Blinged-Out Tacos. THE LAST O.G. COOKBOOK will be released on April 1 in conjunction with the show’s second season in Spring 2019. Tracy Morgan was born in Brooklyn and raised in the Tompkins projects. After becoming a stand-up comedian, he performed as a regular on Saturday Night Live between 1996 and 2003. Later, he would star for seven seasons on NBC’s Emmy- and Golden Globe Award–winning 30 Rock, appearing opposite Tina Fey and Alec Baldwin. At the beginning of 2016, he headlined a nationwide stand-up tour titled Picking Up the Pieces, which culminated in his newest stand-up special StayingAlive, which is available on Netflix. He is the star of The Last O.G., for which filming of the second season recently wrapped. For nearly two centuries, HMH Trade Publishing has published some of the world’s most renowned novels, nonfiction, children’s books, and reference works. As part of a leading global learning company, it is uniquely positioned to offer educational and entertaining content for all audiences. Its distinguished author list includes ten Nobel Prize winners, forty-eight Pulitzer Prize winners, fifteen National Book Award winners, and more than one hundred Caldecott, Newbery, Printz, and Sibert Medal and Honor recipients. HMH publishes such distinguished authors as Philip Roth, Temple Grandin, Tim O'Brien, and Amos Oz, and a celebrated roster of children’s authors and illustrators including Kwame Alexander, Lois Lowry, and Chris Van Allsburg. HMH is also home to The Best American series®; The Whole30®, Weber Grill, Betty Crocker®, Better Homes and Gardens®, How to Cook Everything®, and other leading lifestyle properties; the Peterson Field Guides®; CliffsNotes™; books by J.R.R. Tolkien; and many iconic children’s books and characters, including Curious George®, The Little Prince, and The Polar Express. HMH Productions, its newly launched division, develops and produces media and licensed products related to brands such as Carmen Sandiego and Oregon Trail.